Michael Daniel is a Special Assistant to the President and the Cybersecurity Coordinator. In this position, Michael leads the interagency development of national cybersecurity strategy and policy, and he oversees agencies’ implementation of those policies. Michael also ensures that the federal government is effectively partnering with the private sector, non-governmental organizations, other branches and levels of government, and other nations. Prior to coming to the National Security Staff, Michael served for 17 years with the Office of Management and Budget (OMB). From September 2001 to June 2012, he served as the Chief of the Intelligence Branch, National Security Division, in a career Senior Executive Service position. This branch oversees the Intelligence Community (IC) and other classified Department of Defense programs. In this position, Michael played a key role in shaping intelligence budgets, improving the management of the IC, and resolving major IC policy issues. The branch also oversaw a variety of cross-cutting issues, including cybersecurity, counterterrorism spending, and information sharing and safeguarding. Within OMB, Michael also served as an examiner in the National Security Division’s Front Office supporting the Deputy Associate Director and in the Operations branch reviewing Navy and Marine Corps operational activities and overseas military operations such as Bosnia and Kosovo. Since 2007, Michael has been heavily involved with Federal cybersecurity activities, starting with the Comprehensive National Cybersecurity Initiative. He has worked on cybersecurity funding issues in almost every budget since then and led an annual cross-cut review of Federal agencies’ cybersecurity spending. He represented OMB on cybersecurity issues in the interagency policy process and worked with various Congressional committees and staff on cybersecurity issues. Finally, he has worked on tracking cybersecurity spending and the development of useful cyber performance metrics. Originally from Atlanta, Michael received a Bachelor’s in Public Policy from the Woodrow Wilson School at Princeton University. Subsequently, he obtained a Master’s in Public Policy from the Kennedy School of Government at Harvard with a focus on International Affairs and Security. Michael also obtained a Master of Science in National Resource Strategy from the National Defense University’s Industrial College of the Armed Forces in 2001. Outside of work, Michael and his wife are raising two rambunctious boys. Michael also studies martial arts in the Chishin Ryu style with Dai Nippon Botoku Kai, a Norfolk-based karate association. 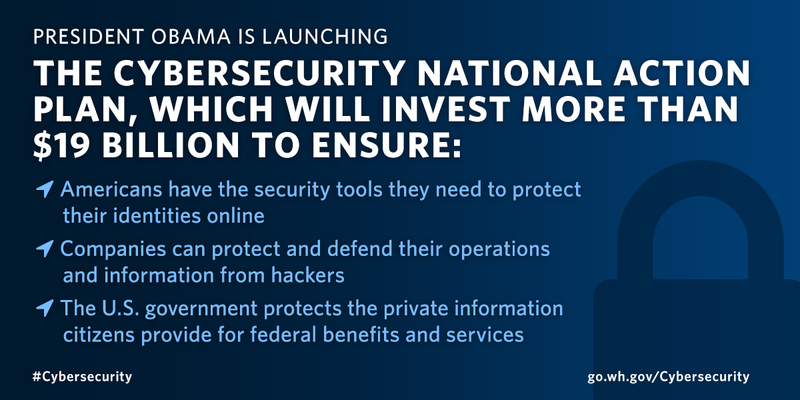 The President just announced a non-partisan commission to make Americans safe in cyberspace. Here are a few answers to questions you might have about the President's new Cybersecurity National Action Plan. Here are a few answers to some questions you may have on how the President's latest Executive Order will strengthen America's cybersecurity. In 2014, we published reports by DHS, Commerce, and Treasury identifying potential incentives that could increase use of the Cybersecurity Framework. Since then, we have worked with the private sector to better understand how the Framework is being used and the most appropriate role for government to play in increasing its use. President Obama is using the week before his State of the Union to highlight the importance of cybersecurity and to outline the steps this Administration is taking to tackle this problem head on.